The Third Committee of the 73rd session of the UN General Assembly (GA) was held 2 October 2018 through 20 November 2018, at the UN Secretariat in New York. This Third Committee featured presentations by a number of senior UN officials, including H.E. Ms. Michelle Bachelet, High Commissioner for Human Rights; Mr. Andrew Gilmour, Assistant Secretary-General (ASG) for human rights; and H. E. Mr. Vojislav Šuc, President of the Human Rights Council. The full list can be found here. The new High Commissioner for Human Rights, Ms. Bachelet, delivered her inaugural address to the Third Committee, and held an interactive dialogue with member States. 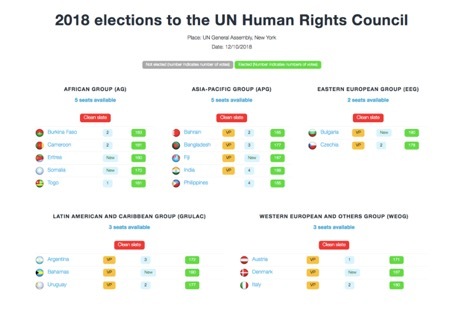 On 12 October elections for Human Rights Council membership were held by the UN General Assembly, with all regions presenting clean slates, and all 18 candidates securing the necessary votes. During the Third Committee more than 110 reports covering different items on the Third Committee’s agenda were considered (see full list here). State representatives gave approximately 580 statements. 64 mandate holders and other experts, representing 55 thematic mandates and 9 country-specific mandates, submitted reports. Find the full list here. 61 of the mandate holders participated in interactive dialogues, in which 98 States, either individually or jointly, offered nearly 600 questions and comments. The Third Committee adopted 57 resolutions: 37 by consensus (65%) and 20 by vote (35%). At least three have clear budget implications. 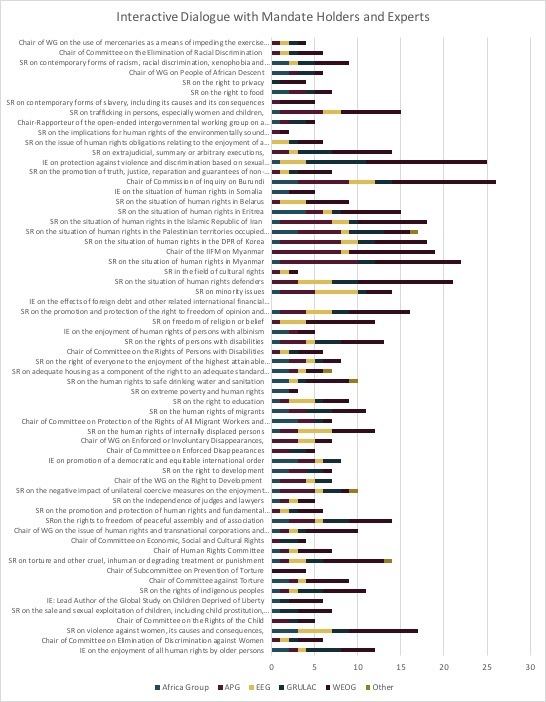 Almost half of the resolutions adopted by the Third Committee demonstrated a high-level of substantive overlap with corresponding resolutions passed by the Human Rights Council in 2018. Indeed, many were almost identical. This session of the Third Committee, also saw the adoption of a number of new resolutions, including resolutions on World Braille Day, Combating Trafficking in Human Organs, Declaration on the Rights of Peasants, Intensification of efforts to prevent and eliminate all forms of violence against women and girls: sexual harassment, Promotion and Protection of Human Rights and Fundamental Freedoms, including the Rights to Peaceful Assembly and Freedom of Association. During voting, seven oral amendments and seven written amendments were put forward by States. All were voted on: just one passed, while the rest were rejected. URG will shortly release a comparative analysis of Third Committee resolutions and Human Rights Council resolutions passed in 2018. Prior to the start of the Third Committee, world leaders engaged in a general debate. The debate, chaired by the President of the GA, María Fernanda Espinosa Garcés, began on 25 September and ended on 1 October 2018. It saw the participation of over 193 high-level dignitaries. URG NYC’s detailed analysis of their 193 speeches identified reference to 1,874 human rights-related topics or subjects. The most widely referenced human rights topic by States in 2018 was climate change. 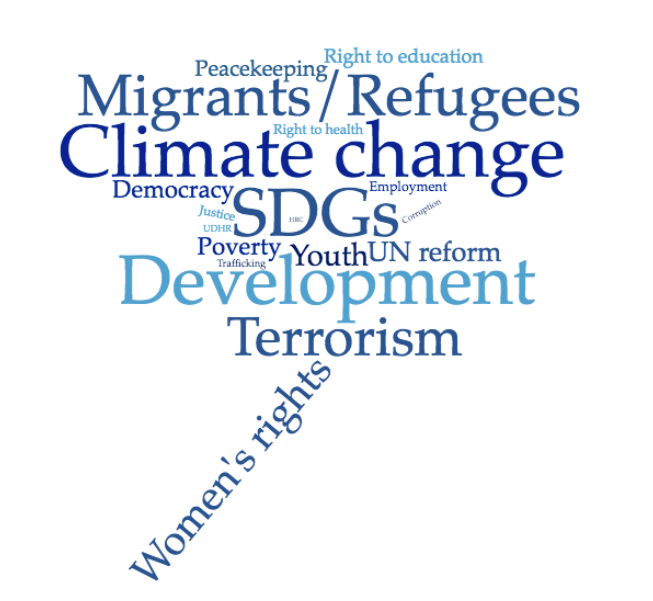 Other key human rights issues and priorities for 2017-2018 include: development and the SDGs, migrants and refugees, terrorism, women’s rights, youth, and poverty. On civil and political rights, important human rights themes included: democracy; good governance; justice; terrorism; the rights of women; and atrocity crimes. In terms of economic, social, and cultural rights issues, States highlighted the 2030 Agenda for Sustainable Development, and the SDGs. Linked with this, States also drew attention to the importance of the role of human rights in the context of the fight against climate change. Other ESCR priorities include: corruption; the right to health, the right to education; employment; and poverty. Regarding country-specific human rights violations and situations of particular concern, States made repeated references to: Israel and the Occupied Palestinian Territories (OPTs); Syria; Myanmar; the Democratic People’s Republic of Korea; Iran; Yemen; Libya; and Crimea/Ukraine. 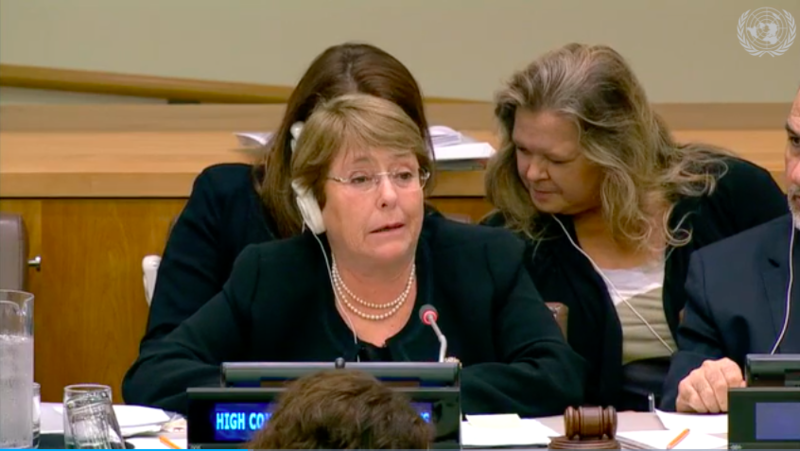 On 15 October, the newly appointed High Commissioner for Human Rights, Michelle Bachelet, addressed the Third Committee of the United Nations General Assembly, and then responded to questions, concerns, and complaints from member States. The High Commissioner underlined the importance of human rights for the achievement of sustainable development and peace and security, and in that regard drew States’ attention to the critical role of the Human Rights Council, the human rights mechanisms, and OHCHR, both in their own regard and in combination with the General Assembly and Security Council. The High Commissioner confronted the notion that the UN human rights system is somehow antagonistic towards States, explaining that the system is there, primarily, to help States secure improvements in the promotion and protection of human rights at the national level. This, in turn, would represent a major contribution to the realisation of the 2030 Agenda for Sustainable Development. Ms. Bachelet also made a strong bid for the more explicit inclusion of the UN’s human rights bodies and mechanisms in the Secretary-General’s prevention agenda. She drew attention to the fact that the human rights system is ideally placed to pick up early warning signs of impending crises. Her convictions were shared by many State representatives; strengthening the role of human rights in the UN’s prevention agenda was repeatedly raised as a key priority within wider efforts to bring ‘Geneva’ and ‘New York’ closer together. 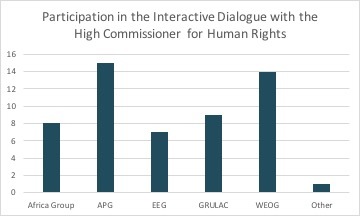 54 States participated in the interactive dialogue, represented in the following graph by regional group. For a fuller analysis of the High Commissioner’s Presentation, see URG NYC’s article here. On 2 November 2018 the Human Rights Council President, Mr. Vojislav Šuc, presented the Report of the Human Rights Council (A/73/53) to the Third Committee of the UN General Assembly. The Council President’s presentation and subsequent interactive dialogue with Third Committee members highlighted current challenges, reiterated longstanding critiques, and explored the Third Committee’s relationship with the GA’s controversial subsidiary Body. President Šuc described Council reform initiatives as especially aimed at allowing small delegations more space, and more time for debate. He described the reform process as involving open-ended consultations on efficiency and effectiveness. He also emphasised that New York and Geneva should work together, with shared focus on both sides of the Atlantic, narrowing the divide through action. The President noted how the mechanisms and tools of the Council can contribute to the Secretary-General’s prevention agenda. He described how the Council can be a source of invaluable information, expertise and analysis brought to Council directly from the ground, through Special Procedures mandate holders, and civil society. President Šuc also took the opportunity to condemn reprisals against civil society and human rights defenders engaging with the Council, and threats made against Special Procedures mandate holders. Hungary, while noting concerns about selectivity and workload politicization, urged that the Human Rights Council should not be looked at like an enemy, but as an institution promoting and protecting human rights. Latvia also emphasised that human rights is more than a pillar of the UN, it is its backbone. The Africa Group stressed the need to build resilience, and argued that economic, social and cultural rights, including the right to development, should be discussed on equal footing with civil and political rights. 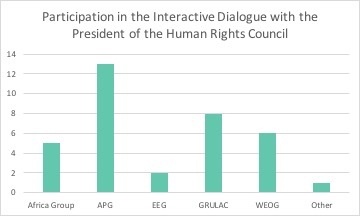 25 States participated in the interactive dialogue and gave statements following the Council President’s presentation, represented in the following graph by regional group. 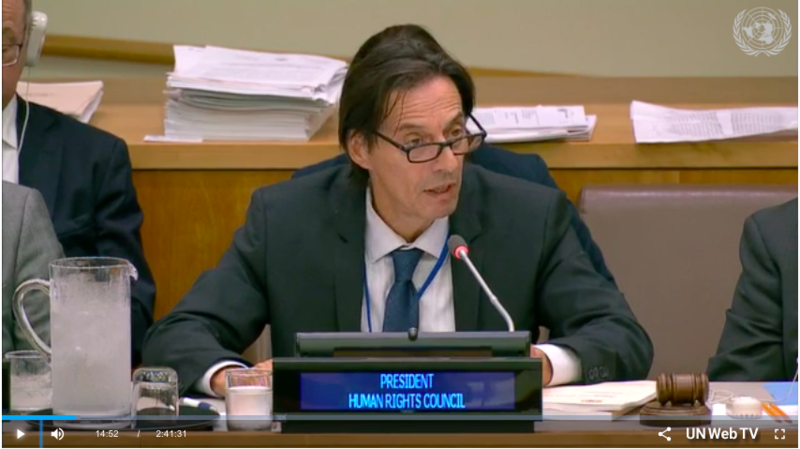 For a more in-depth analysis of the HRC President’s presentation, subsequent interactive dialogue, and the tabling of the Human Rights Council resolution, see URG NYC’s article here. 64 mandate holders and experts (55 thematic, 9 country-specific), representing both Special Procedures and Investigative Mechanisms of the Council, submitted reports to the Third Committee. Find the full list here. 61 mandate holders gave presentations and participated in interactive dialogues, in which 98 States, either individually or jointly, gave remarks or asked questions; 17 from the African Group, 27 from the Asia Pacific Group (APG), 13 from Eastern Europe Group (EEG), 15 from the GRULAC, 25 from the Western Europe and Other Group (WEOG), 1 from other countries (State of Palestine). 67 remarks/questions came from the Africa Group (11%); 118 from the APG (20%); 73 from EEG (12%); 85 from GRULAC (14%); and 254 from WEOG (43%). Elections for membership of the Human Rights Council (for three-year terms, 2019-2021) took place on 12 October in New York. All regional groups presented clean slates for the elections. All regional groups have in fact, over the past twelve years, presented clean slates on several occasions. No candidate country on a clean slate has ever failed to secure the simple majority of votes needed to win a Council seat, and this was also the case on October 12th, when all candidates succeeded in becoming members. Notable additions to the 2019-2021 Council include the Bahamas and Fiji, as Small Island Developing States have been historically unrepresented at the Council. Iceland also joined the Council earlier in the fall, taking the place of the United States after it withdrew its membership. Go to yourHRC for more information on the candidates and the elections results. On 2 October the Third Committee began in dramatic fashion, with the Burundi delegation strongly opposing the last-minute inclusion of the “Commission of Inquiry on Human Rights in Burundi” on the list of Council mandated experts set to engage with the Committee. The Burundi delegation argued that while the Council had called for the Commission to “communicate” its report to relevant UN bodies, this did not necessarily mean physically presenting. In addition, the Burundi delegation pointed out that after the renewal of the mandate by the Council in September 2018, the latest text called for the Commission to present at the 74th session of the General Assembly, not the 73rd. A Secretariat official explained that the Secretariat had waited to add the Burundi Commission of Inquiry, and the Independent Expert on Somalia, to the list of presentations until the Council renewed/extended their mandates in September. He nonetheless recalled that the previous Council resolution 36/19, adopted in 2017, had requested that the Burundi Commission of Inquiry present an oral briefing at the 73rd session of the Third Committee. For the Independent Expert on Somalia, the Secretariat cited operative paragraph 14 of Council resolution 36/27, requesting the Independent Expert on Somalia to report to the 73rd session of the Third Committee, as well as operative paragraph 13 of Council resolution 39/23 extending its mandate. The Burundi delegation claimed that the mandate cited by the Secretariat had been invalidated by the more recent Council resolution. The Secretariat officially responded by citing similar cases of the Council extending a mandate in September, without invalidating prior mandates to present. On 8 October the representative of Burundi requested a legal opinion on the issue from the Office of Legal Affairs (OLA). While several States protested the attempted targeted removal of mandate holders from the list, member States on the whole supported the right of Burundi to request the legal opinion, and when the Committee reconvened on October 10, member States voted 91 in favour to 1 against (United States, who stated that a legal opinion cannot be sought by individual States but by an inter-governmental body), with 66 abstentions, to approve the request to seek, from the OLA, clarification on the legal basis for inclusion of the Commission of Inquiry on Burundi on the agenda. On 16 October the OLA confirmed the legal right of the mandate holders to present. The representative of Burundi protested that the expediency with which it was returned was testament to the opinion being politically motivated, and therefore not legally binding. The Bureau Secretary responded that it is uncommon for Member States to criticise the Secretariat for being fast, and he explained that the reason the legal opinion was rendered so quickly was that the OLA had begun working on the issue on 2 October, in case the Third Committee would be placing a formal request. 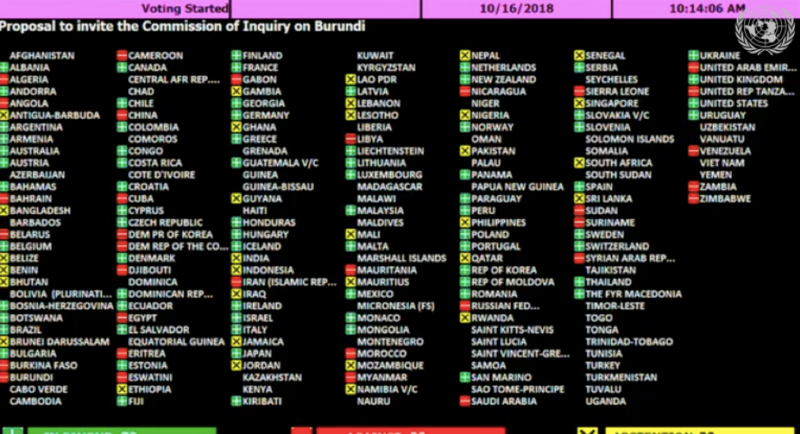 States proceeded to vote with 73 in favour, to 33 against, with 32 abstentions, to invite the Commission of Inquiry on Burundi to present their report and engage in an interactive dialogue. On 24 October, when the Chair of Commission of Inquiry on Burundi ultimately presented his report to the Third Committee, the Burundi delegation responded by rejecting the report as a document riddled with falsehoods that weaponized human rights to justify interference in Burundian affairs. He expressed a desire to take the members of the Commission to court, and prosecute them, warning that this would not go “unpunished.” The Chair of the Commission pressed Burundi on what punishment it had in mind, adding that the members of the Commission were not intimidated and would continue their work as long as they were mandated to do so. The 73rd session of the Third Committee concluded with the adoption of 57 resolutions; 37 by consensus (65%) and 20 by vote (35%). 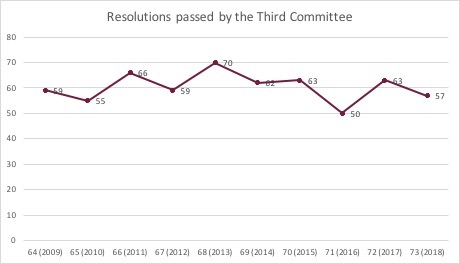 For reference, the 72nd (2017) session of the Third Committee saw 65% of resolutions passed by consensus and 35% by vote, and the 71st session (in which many of the same resolutions were voted on as the 73rd) 68% were passed by consensus and 32% by vote. 52 (91%) of this year’s adopted resolutions were thematic in nature, while five (9%) dealt with country-specific situations. Only 5% had clear/immediate budget implications. States submitted seven oral amendments and seven written amendments, all of which were voted on, only one was passed; the rest were rejected. To compare this session with previous ones, given that many resolutions are biennial, it is useful to compare the 73rd session (2018) particularly with the 71st session (2016) and the 69th session (2014). 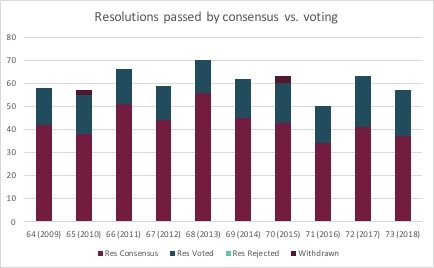 While this session may have seemed particularly contentious, percentage-wise the number of resolutions passed by consensus as opposed to vote is nearly identical with previous years. 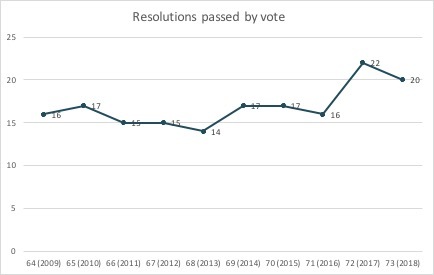 However, comparing the number of resolutions passed by vote in 2018, as opposed to 2016, shows a jump of four more resolutions passed by vote. This is in part due to the US calling for a vote on resolutions that normally pass by consensus. 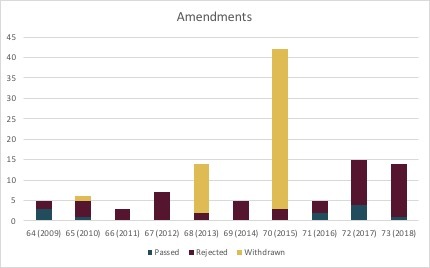 In addition, it would appear that the number of amendments is rising, with nine more amendments submitted this year than in 2016, though fewer than were submitted in 2017, but also with fewer (only one) passing. On 6 November the representative of Antigua and Barbuda introduced draft resolution “World Braille Day” (A/C.3/73/L.5/Rev.1), expecting it to pass by consensus, expressing that support for the text exemplified the commitment of Member States to “leave no one behind.” A Secretariat official noted that the activities in its operative paragraph 5 would require voluntary contributions, and its adoption would not raise budgetary implications for 2018-2019. The Committee approved the text by consensus. On 8 November the Third Committee approved its first‑ever draft resolution on combating trafficking in human organs (A/C.3/73/L.12/Rev.1.) entitled “Strengthening and promoting effective measures and international cooperation on organ donation and transplantation to prevent and combat trafficking in persons for the purpose of organ removal and trafficking in human organs”. Spain’s delegate introduced it as new crime-preventing tool, and it passed by consensus. New resolution on the“Declaration on the right of peasants and other people working in rural areas” (A/C.3/73/L.30) was directly imported from the 39th session of the Human Rights Council; the representative of Bolivia, also the main sponsor of the Council resolution, introduced the resolution as recognising the role of family agriculture in reducing poverty, the interconnectedness of human rights and land rights, the vulnerability of agricultural communities to climate change, and the value peasants add (producing 70% of the world’s food) to the world at large. Switzerland’s representative noted that they had voted yes to the resolution at the Council, and would thus do so again at the Third Committee. Some States, like the United Kingdom, expressed concerns about the resolution, fearing that it set up new rights including collective rights for certain workers, and voted against it. While most said that the principle was valuable, some States felt that the resolution needed more time and work before it could be actionable, though they acknowledged that this resolution constituted a non-legally binding declaration. Resolution A/C.3/73/L.30 was adopted by a vote: 119 in favour, seven against, and 49 abstentions. On 19 November, the first ever Third Committee resolution on sexual harassment was adopted in the Third Committee. The resolution, “Intensification of efforts to prevent and eliminate all forms of violence against women and girls: sexual harassment” A/C.3/73/L.21/Rev.1, introduced by the Netherlands, set standards for combating sexual harassment in both online and offline environments, noting the vulnerability of women and girls in public and private spaces and urging States in particular to address structural causes of sexual harassment by modifying social and cultural patterns. The US delegation, however, challenged the consensus (past texts on the “intensification of efforts to prevent and eliminate all forms of violence against women and girls,” regardless of their theme, have traditionally passed by consensus) with two proposed “common sense” amendments. The Committee then rejected the oral amendment to operative paragraph 8(d) to “L.21/Rev1”, by a vote of 88 against to 44 in favour, with 25 abstentions and oral amendment to operative paragraph 11 in “L.21/Rev.1” by a vote of 98 against to 30 in favour, with 30 abstentions. The resolution was then passed by consensus. On 20 November, the United States delegation introduced resolution A/C.3/73/L.41/Rev.1 on the “Promotion and protection of human rights and fundamental freedoms, including the rights to peaceful assembly and freedom of association”. The resolution was lauded for the inclusion of language highlighting vulnerable human rights defenders such as women, environmental rights defenders and indigenous people, and condemns reprisals against those taking part in protests, as well as reporters covering demonstrations. It came to a vote and passed with 143 in favour, and zero against, with 38 abstentions. On 13 October, the Third Committee tabled resolution A/C.3/73/L.56 on the Report of the Human Rights Council and opened the floor to State comments. The two key areas of debate were the procedural credibility of the resolution itself, and the inclusion of country specific measures. On the first, the representative of Costa Rica, and also the representative of Lichtenstein (speaking on behalf of 4 others), pointed out that A/Res/65/281 called for the Third Committee to discuss the recommendations of the Council, while it is the responsibility of the plenary of the General Assembly, and not of the Third Committee, to take action on the Council report. Austria, speaking on behalf of EU, shared this view, adding that for the Committee to take note of the entire report in a broad resolution is inherently problematic. All of the States who opposed the Council Report cited their opposition to country-specific resolutions (and all of them had been the recipients of country-specific Council resolutions themselves). The resolution passed with 111 votes in favor, 3 against, and 65 abstentions. Read more here. The representative of Sweden introduced the draft resolution “Office of the United Nations High Commissioner for Refugees” (A/C.3/73/L.59). The draft was negotiated in Geneva and calls for more equitable sharing of responsibility for refugees. The text has been adopted by consensus for the past ten years, but this year, it came to a vote, with the United States as the first and only state to vote against it (claiming that elements of the resolution ran contrary to US immigration policies). 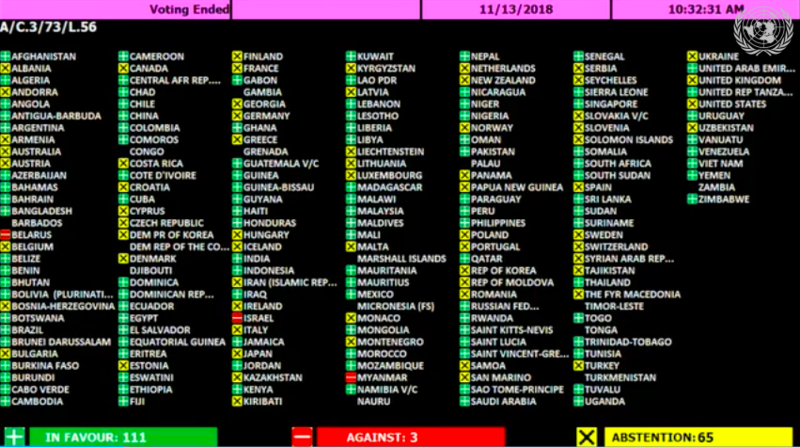 The Committee then approved the draft resolution by a recorded vote of 176 in favor to 1 against (US), with 3 abstentions (Eritrea, Liberia, Libya). On 13 November the Committee took up the draft resolution titled, “Moratorium on the use of the death penalty” (A/C.3/73/L.44). Singapore’s delegate objected to what it perceived as a “one size fits-all” approach, and, on behalf of 34 countries, introduced amendment A/C.3/73/L.57 with a new operative paragraph reaffirming the sovereign right of all countries to develop their own legal systems (in keeping with international legal obligations). The issue of sovereignty, particularly with this resolution, persists as a recurring debate at the Third Committee. Canada’s delegate argued that the sponsors of the draft resolution had already, in the name of balance, woven “State sovereignty into the very fabric” of the text. The Chile delegate also pointed out that the amendment adds in language that had been deleted during informal meetings, and that efforts like this restrict the development of human rights. The Committee ultimately approved the amendment by a vote of 96 in favor to 73 against, with 14 abstentions. The Committee then approved the draft resolution as amended by a vote of 123 in favour to 36 against, with 30 abstentions. The resolution was adopted with 8 more countries voting in favor than the last time it was introduced in 2016. Clashes started over two amendments proposed to the resolution on “Extrajudicial, summary or arbitrary executions” (A/C.3/73/L.39/Rev.1). The representative of Sudan introduced draft amendment (A/C.3/73/L.62) seeking to remove reference to the International Criminal Court, with the representative of Sudan saying that the standardized endorsement of the ICC inhibits multilateralism. The representative of Canada, speaking also on behalf of Australia, Liechtenstein, New Zealand and Switzerland, said these violations can constitute serious crimes of genocide and crimes against humanity, to which States have a responsibility to respond, though the resolution does not require States to become party to the ICC. The Committee then rejected the draft amendment by a vote of 103 against to 21 in favour, with 34 abstentions. Next, the Committee turned to draft amendment A/C.3/73/L.65. The representative of Egypt, on behalf of the Organization of Islamic Cooperation (OIC), introduced an amendment to operative paragraph 7(b), calling for the removal of a list in the resolution specifically detailing groups vulnerable to the extrajudicial killings, including human rights defenders, and those targeted for their sexual or gender identity. Similar language had come under scrutiny in Geneva. The representative of Australia, speaking on behalf of Canada, Iceland, Liechtenstein, New Zealand and Switzerland, said language on the execution of individuals because of their sexual orientation had been introduced more than 10 years ago. Further, the section in question does not oblige States to change their broader domestic laws on these issues. Tunisia withdrew its backing for the amendment, alongside Albania, Turkey and Lebanon, signaling a clash within the OIC. The Committee then rejected the amendment by a vote of 86 against to 50 in favour, with 25 abstentions. The resolution was then adopted by vote of 110 in favor, 0 against, with States 67 abstaining. No new country resolutions were tabled, and all five were passed (see the resolutions chart above). Several of the country resolutions prompted intense debate, and in several cases reports by special procedures mandate holders were cited by States as evidence anchoring the conclusions and recommendations in the resolutions. While at the previous two Third Committee sessions the resolution on the subject of human rights in the Democratic People’s Republic of Korea had passed by consensus, this year Sudan’s delegate proposed an amendment deleting the draft’s reference to the ICC (which had been consensus language for years) (A/C.3/73/L.60). The representative of Austria, speaking on behalf of the EU, pointed out that the numerous violations of humanitarian law and human rights in the DPRK only served to remind the Committee of the ICC’s relevance. The Committee then rejected the amendment by a recorded vote of 91 against to 22 in favour, with 44 abstentions, and the resolution was then passed by consensus. The Committee’s approval of a draft on the human rights situation in Myanmar was marked by contention around the validity, terminology and implications of the Independent International Fact-Finding Mission’s report. Nonetheless, the resolution on Myanmar passed by a vote of 142 in favour to 10 against, with 26 States abstaining, calling for an independent investigation and international support for funding. During the Third Committee, representatives from the Mexico delegation and the Egypt delegation decided to echo the work of their colleagues at the 37th session of the Human Rights Council by merging their respective resolutions: Mexico has traditionally led the “Protection of human rights and fundamental freedoms while countering terrorism” biennial resolution, due to come up in next year’s 74th session, and Egypt has traditionally led the “Effects of the terrorism on the enjoyment of human rights” which was due to come up in this year’s 73rd session. Mexico and Egypt decided to merge their resolutions in the interest of efficiency and preventing duplication. Mexico and Egypt started their negotiation using the merged document from Geneva, rather than beginning with the two Third Committee resolutions. While this is a potentially promising approach at efficiency, efficacy, and coordination on resolutions between New York and Geneva, there remain concerns about insufficient consultation during the New York merging process, potential asymmetries in this and future merging processes between delegations, and the risk of sacrificing vital, hard-won human rights language (in both Council Resolutions and Third Committee resolutions) as part of the process. The Third Committee passed the resulting resolution A/C.3/73/L.43/rev.1 on terrorism and human rights by consensus. After leaving the Human Rights Council, the United States emphasized that it would continue to champion human rights issues, including at the UN Security Council and Third Committee. US participation at the Third Committee on the whole however has become marked by the US delegation being seen to focus on explicitly defending and promoting what is perceived as domestic priorities of the present US administration, even when such priorities challenged longstanding practice on previously agreed upon language in resolutions, confounded traditional allies, ran contrary to consensus, and appeared to many to stunt or even reverse progress on human rights issues, particularly on gender and reproductive rights. The US put forward 5 out of the 7 total oral amendments, with all 5 of their amendments rejected by vote. The US also introduced a new resolution A/C.3/73/L.41/Rev.1 on the Promotion and Protection of Human Rights and Fundamental Freedoms, including the Rights to Peaceful Assembly and Freedom of Association, which passed by vote. The UN Special Rapporteur on human rights obligations relating to the enjoyment of a safe, clean, healthy and sustainable environment, David R. Boyd, made a historic push at the UN General Assembly for the human right to a healthy environment to be recognized at the global level. During his landmark address at the GA’s Third Committee, Boyd argued, firstly, that official UN recognition of the human right to a healthy environment would bolster work already underway at international, regional and national levels, and secondly would contribute to the mutually dependent goals of promoting the full enjoyment of human rights and protecting and conserving the natural environment. 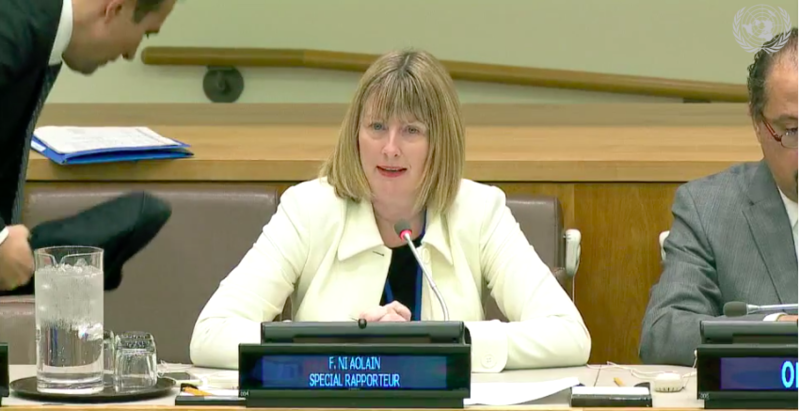 See more on the Special Rapporteur’s dialogue with the Third Committee here. This year’s Third Committee saw the inaugural speech of the new High Commissioner for Human Rights, Michelle Bachelet, and positive engagement in the interactive dialogue with both her, and the President of the Human Rights Council, Vojislav Šuc. Both the High Commissioner and Council President raised the potential of human rights mechanisms, including the Council, to support the Secretary-General’s prevention agenda. While some member States leveled criticism at the Council and the broader UN human rights system, they still praised the Universal Periodic Review (UPR), and a larger number of States expressed support for the Council’s work, including the need for enhanced cooperation between New York and Geneva. The Human Rights Council elections saw the continued use of clean slates virtually guaranteeing membership for candidates, including States with poor human rights records, which some States argue diminishes the credibility of the Council. However, this year also saw the inclusion of new small States, particularly small island States, which according to new members was made possible in part due to the clean slate process eliminating the need for prohibitively costly competitive elections. While the US dominated the spotlight during the process, with controversial oral amendments, and voting no on traditionally consensus resolutions, the Council saw many interesting developments, including the merging of the Egypt-Mexico resolutions on human rights and terrorism/counterterrorism in the interest of efficiency, a trend expected to increase. In addition, new resolutions on freedom of assembly, combating sexual harassment, and recognizing the value of Braille, were passed. This Third Committee session also raised questions about adherence to procedure and Third Committee norms, with long-agreed upon language challenged on multiple occasions, and questions about breach of procedures/tradition with late amendments seeking to undo or circumvent the results of informal discussions. The drama around the inclusion of the Burundi Commission of Inquiry on the list of special procedures highlighted several important procedural issues in the Third Committee; that a special procedures mandate specifying the session number is helpful to ensuring inclusion on the agenda, and that a renewed mandate does not disqualify the request to present in a prior mandate. States fought to retain long held language, not only for the sake of consensus, but noting the value of the infusion of perspectives during the years in which such language was forged. Nonetheless, despite a handful of States consistently rejecting the notion of country-specific resolutions, all of them passed, and despite the contentious nature of this voting process, percentage-wise not that many more resolutions came to a vote than last year or the year before. With the Third Committee looking to improve efficiency without losing tightly gripped standards and without stymying steady progress on human rights issues, States engaged at this session as much on procedure and the legacy of language as on the substance, with the institution (and the place of human rights in it) as much on the table as the issues. The information and data presented in this report came from UN Web TV live streaming of Third Committee sessions and recorded videos of Committee sessions; observations made while present in Third Committee sessions; UN Press Releases of Third Committee sessions; The UN General Assembly Third Committee documentation and reports (see more here); confidential conversations with a number of UN missions and civil society representatives. Michelle Bachelet, United Nations, High Commissioner for Human Rights at the 73rd session of the Third Committee. 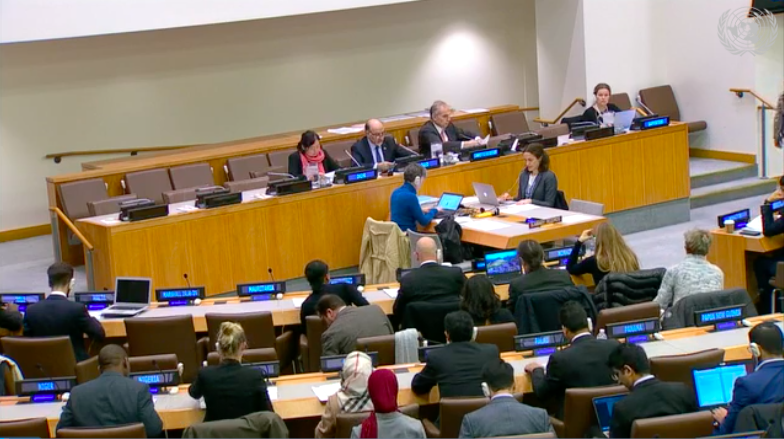 Screenshot from UN Web TV/17th meeting-General Assembly/73rd session.